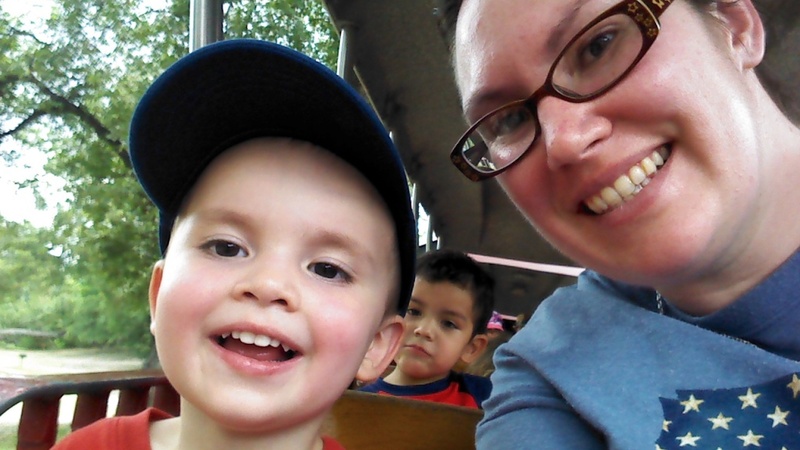 Weekly Happenings: This past week (mainly the weekend), Joseph got a lot of one-on-one time with me and Paul. During the week it was pretty much the normal stuff, but Friday was a little different. 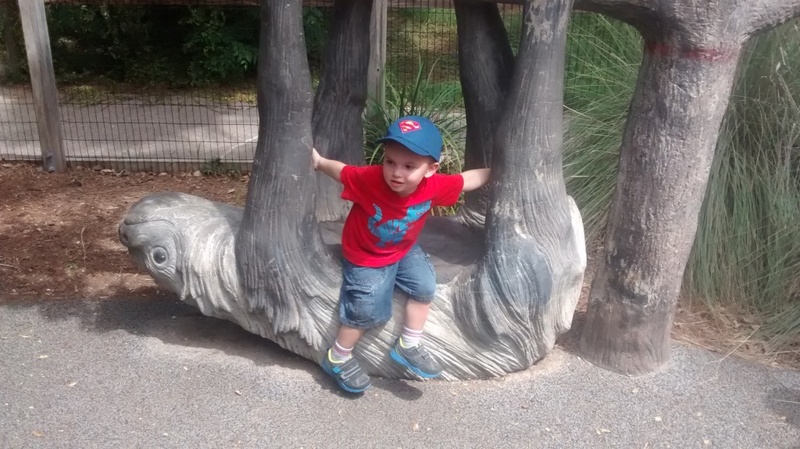 During the day, Joseph and I met up with some friends at the zoo. We spent the entire time in the “Tiny Tot Nature Spot”. 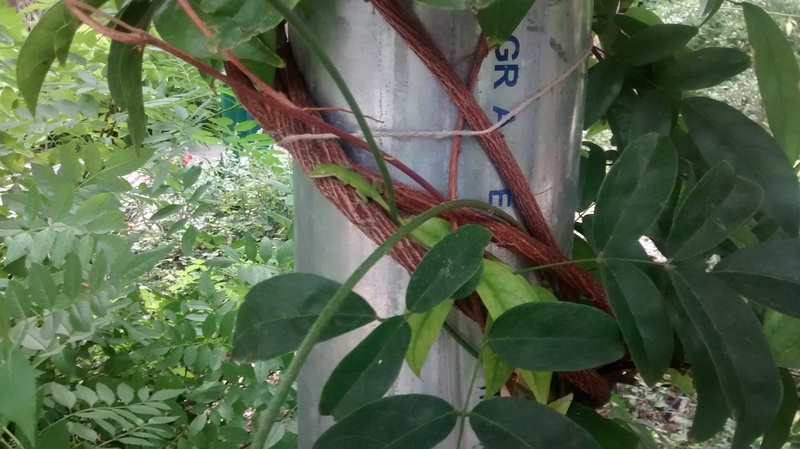 It’s an area of the zoo where there are a bunch of different nature-themed things set up. There’s a mock-camping area, a small canoe set up next to a dock (a real one with water and fish), and other things. After we got home, Paul was home from work, but had a camp-out, so I took Joseph (who was pretty sad that he couldn’t go on the camp-out with Daddy) out to eat (Chipotle) and then to the mall, followed by a trip to Target. 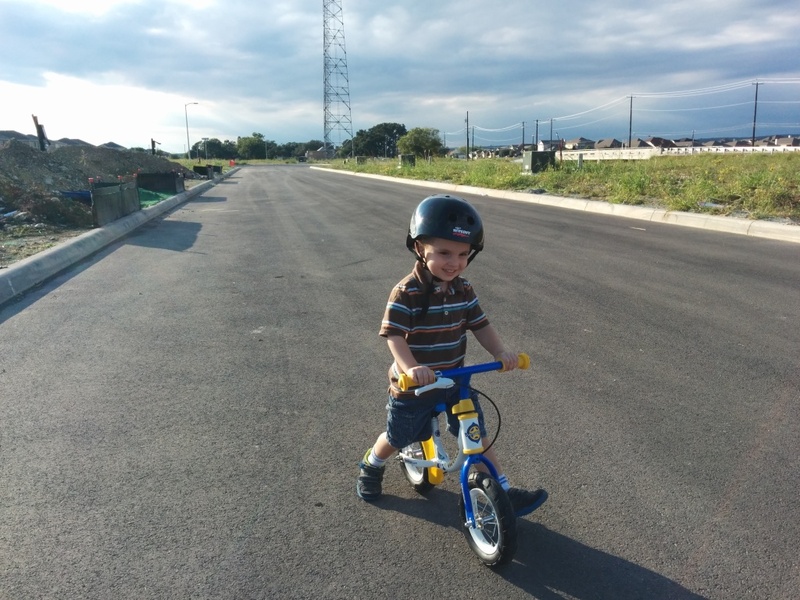 Then Saturday evening, while I was at the General Women’s Meeting, he and Paul went for a long walk/bike ride around the neighborhood, followed by a trip to Wal-Mart. The Weekly Weather: It’s been gorgeous this past week! The temperature never went over 90 degrees! We also got a lot of rain this past weekend (good because we needed the rain, but bad because Paul was stuck camping in it). What Paul’s Been Up To: Working, doing his online courses, and homework. He also had the aforementioned camp-out. He thought there might be rain, so he packed a poncho. While he didn’t stay completely dry (it was kind of hard to do so in pouring rain), he was a lot dryer than most of the other people there. What Sarah’s Been Up To: Visiting teaching stuff, picking out music for the ward choir to sing, and starting to practice music for the Messiah production that will be coming up. I also put up the Halloween decorations. 🙂 One funny thing that happened was that when I started to try to do some cleaning, Joseph grabbed my arm and insisted that I come and watch Mickey Mouse with him. It didn’t take too much convincing. 🙂 I also got to attend the General Women’s Meeting for church. It’s always a great event. My friend picked me up, there was ice cream before the broadcast, and the broadcast itself was incredibly uplifting. What Joseph’s Been Up To: At the beginning of the week, he had a mysterious fever (no other symptoms) that just went away after a few days. I’m grateful it didn’t turn into an ear infection or strep throat. Other than that, cuteness as usual. 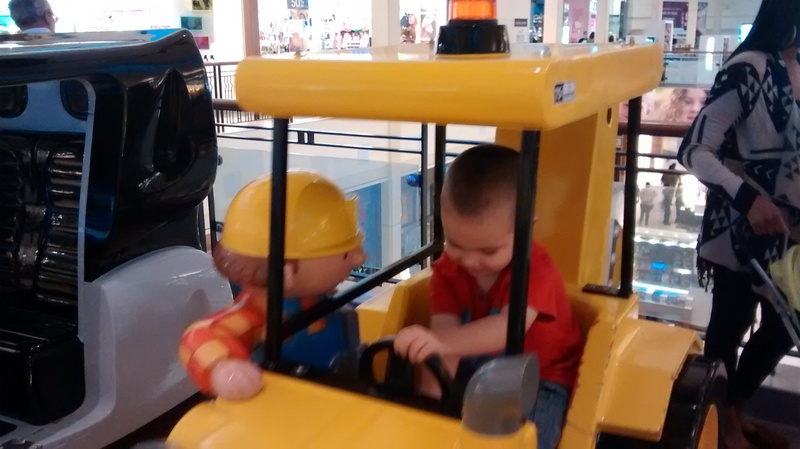 When we went in to Paul’s work last week, Paul showed Joseph how to check books out and in. A few days ago, Joseph brought one of his books up to me, flipped it over, and showed me the bar code. He then told me that Daddy could borrow his book, but he had to scan it. Ha! He has also been really getting into the the little exercise routine that they play on occasion on PBS (a little cartoon animal that has them exercise like different people: marching band, surfer, etc.). He also insists that anyone who is in the room with him exercises, too. 🙂 Finally, he’s been working on singing more with me. His favorite songs to sing along to are “This Little Candle Light of Mine”, “A Child’s Prayer”, and “Momma, Buy Me a Rocking Chair”. I was surprised that he knows about 90% of all of those songs. 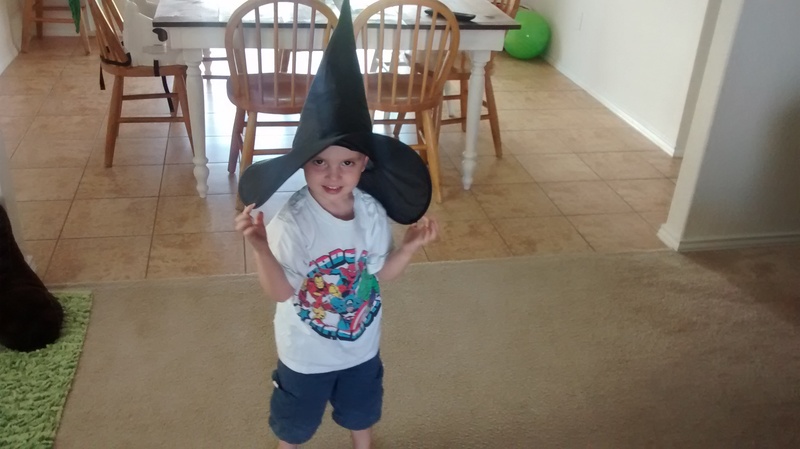 He was happy to see the witch hat again. 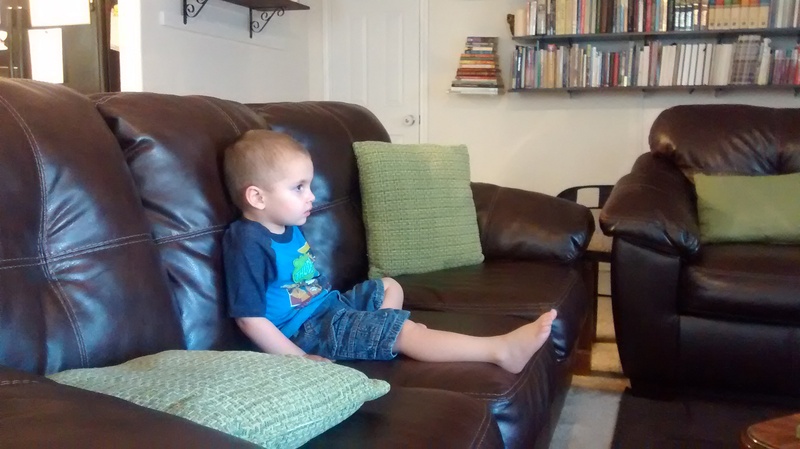 He asked to watch the “Wiggles” DVD that he has. That thing seriously has hypnotic properties. 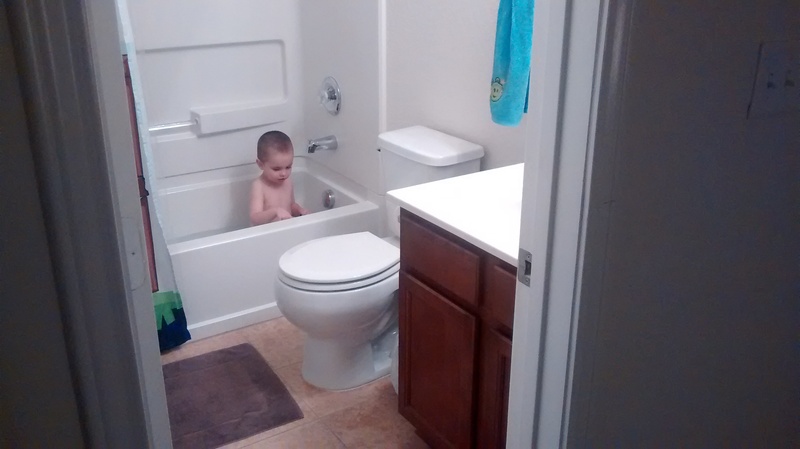 If I try to be lazy and skip bath time, he lets me know. He loves his bath time! Can you see the tiny lizard? 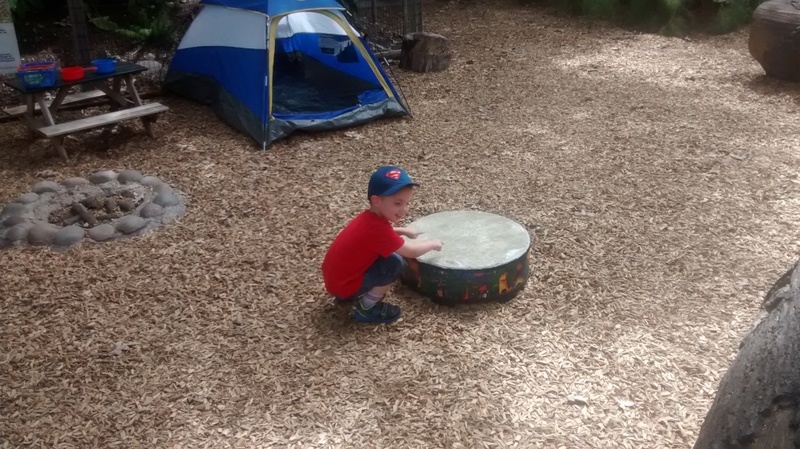 Playing the drum at the camp area of the Tiny Tot Nature Spot. 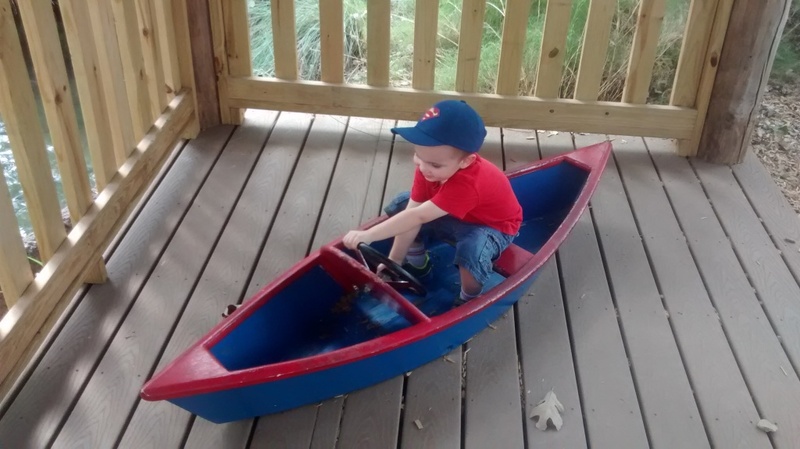 Driving the canoe. I’m not sure why there’s a wheel in it. 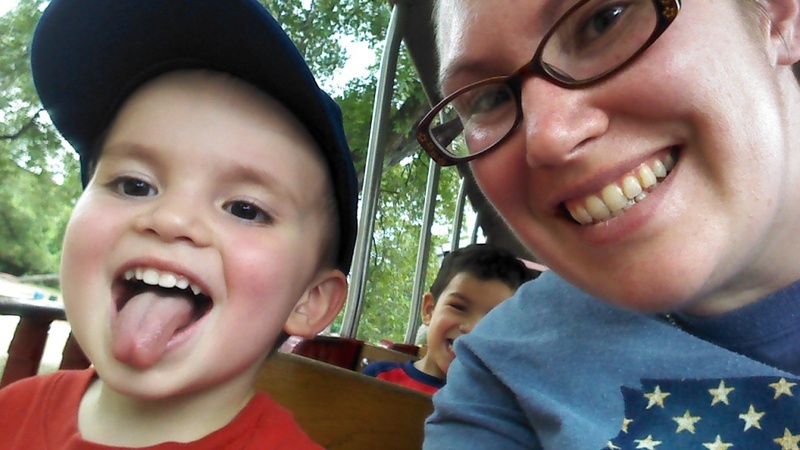 On the zoo train. I love this kid. 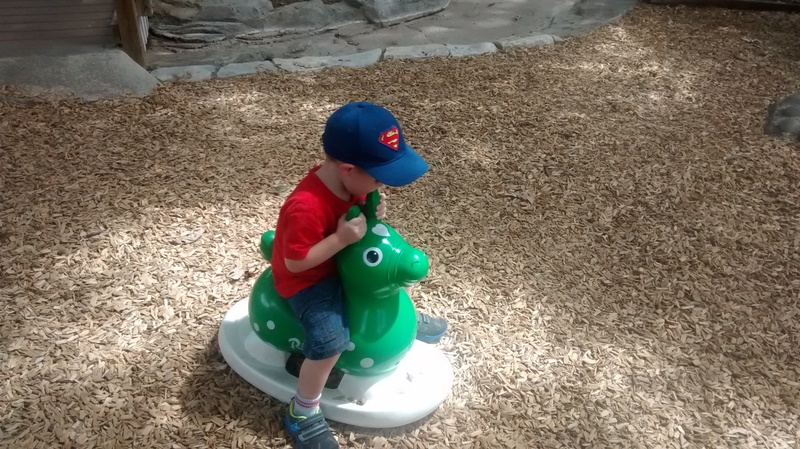 He loved this ride-on thing in the camp area, too. 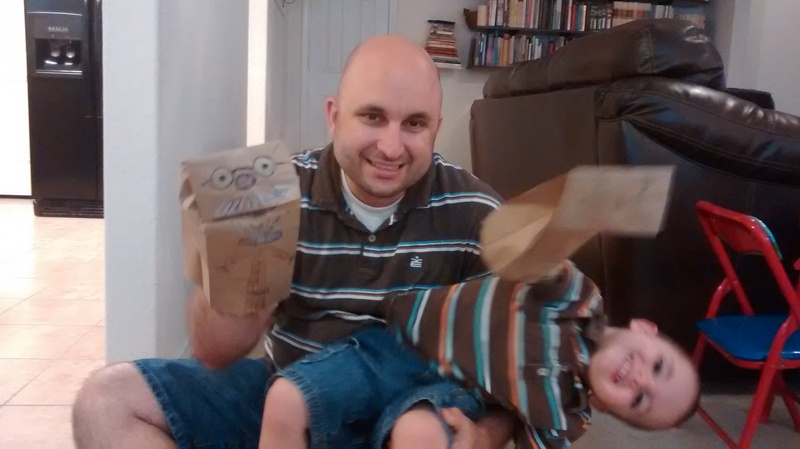 Yesterday was a relatively rainy day, so we stayed inside and made puppets. 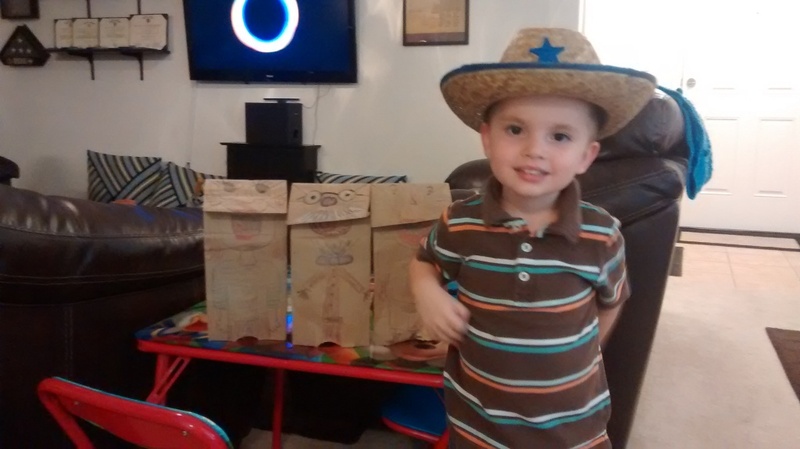 Joseph showing off the puppets (and his love for Western wear). 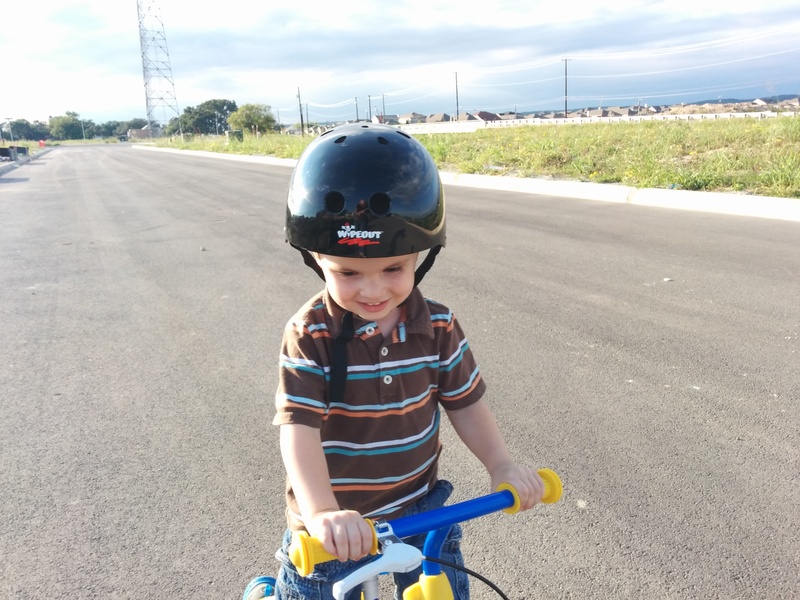 Riding his bike with Daddy.